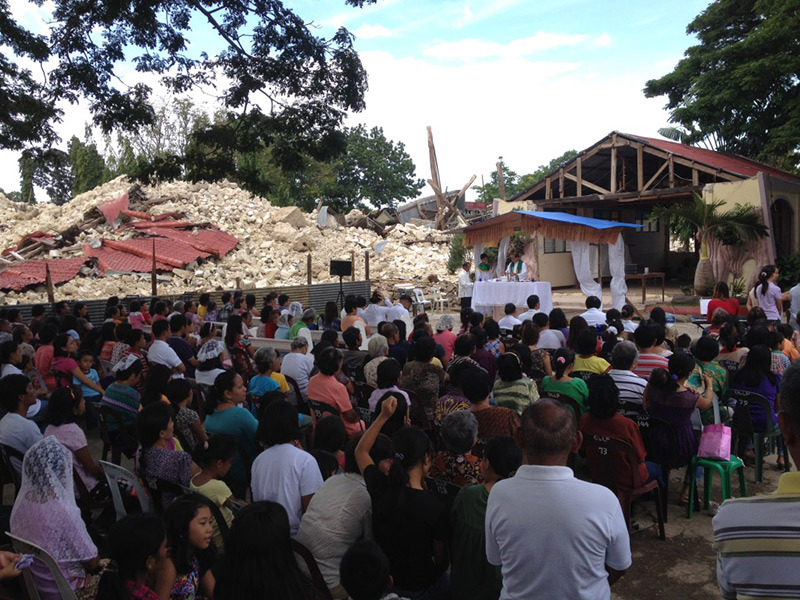 People gathered at Sunday service to pray for the victims of Typhoon Haiyan. As grieving people in the central Philippines bury their loved ones and begin to restore shattered lives, we are again wondering: Was the awesome typhoon Haiyan a response to global warming? We don’t know. Nobody knows, but when you add more energy to a system, you can get more energy out of it. And so for a decade or two, we’ve heard that warming is going to make more hurricanes, stronger hurricanes, or both. Measurements of numbers and intensity are much better in the Atlantic than the Pacific. A study based on six computer models projects that typhoons will get more intense in the Northwest Pacific. “Track density” measures the annual number of storms entering cells in a grid laid across the globe. The graph shows the projected average over the period 2006 to 2100 compared to the average for 1950 to 2005. In the white regions, fewer than five of the models agreed on the direction of the change. At its simplest, the expectation for increased tropical cyclones is based on the idea that because greenhouse gases reflect energy back to the planet, more energy is available to power stronger storms. A hurricane is a cyclonic machine that transfers energy from the warm ocean to the cold atmosphere above. But that shape, with organized updrafts, can be blown apart by winds moving in different directions at various levels of the atmosphere, and some climate models predict that stronger wind shear will actually blow tropical cyclones apart before they mature. 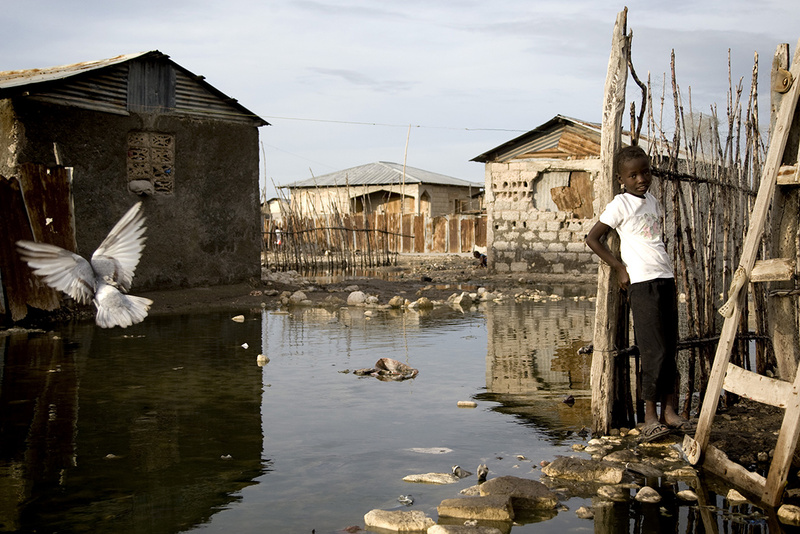 A girl is surrounded by water in Raboto, a slum in Gonaives, Haiti. 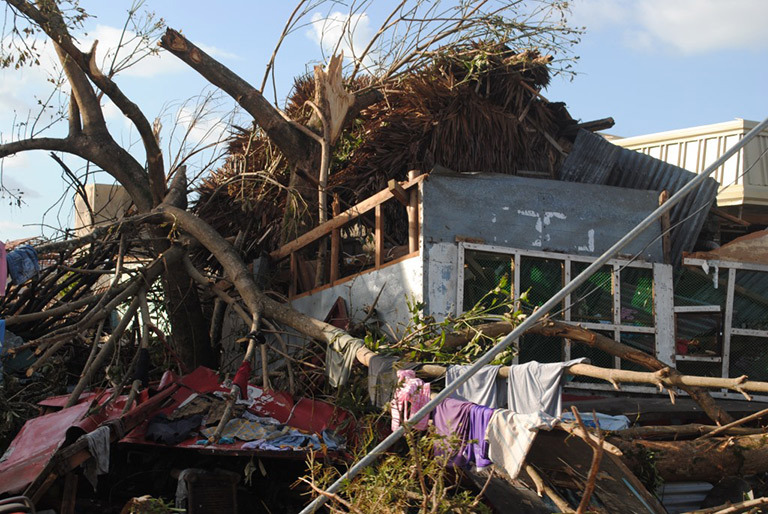 Hurricane Tomas devastated the town, flooding streets and houses and hampering the response to cholera that was spreading across the country. The biggest single problem in understanding the present and forecasting the future of tropical cyclones resides in a shortage of data, especially in the Northwest Pacific, Haiyan’s neighborhood. “We have records of various quality going back in time for various periods, depending on the location,” is how Knutson sums up the situation. None of this proves that deadly typhoon Haiyan was a product of global warming. That’s frustrating, and frustrated journalists tend to stretch for a sports metaphor. Imagine Beardy Barry, a first baseman who is batting .333. Getting one hit in three times at bat makes him happy on payday, and Beardy will get more hits than Furry Freddy, who is batting .250, if they both play enough games for statistics to apply. Graph: Kerry Emanuel, PNAS, 8 July 2013. Is the past prologue? 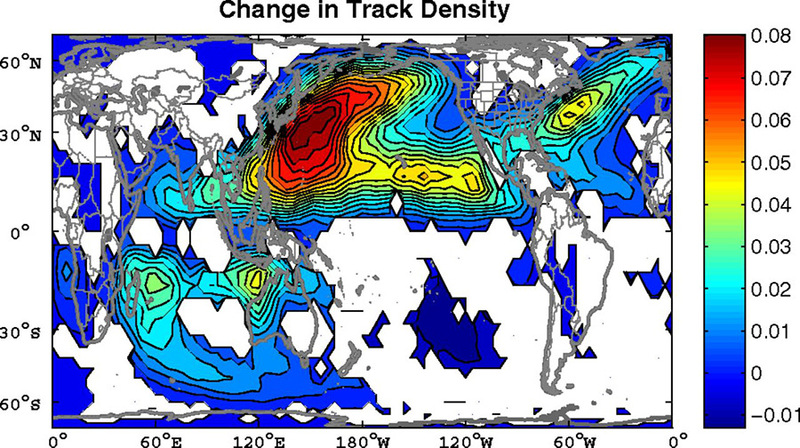 The global annual frequency of tropical cyclones was averaged in 10-year blocks, using historical simulations until 2005, and a projection starting in 2006. Red line: median among six models. Box bottom: 25th percentile; box top; 75th percentile. But a good average does not insure Beardy against striking out three times in a row. And a lousy average does not prevent Furry from swatting the occasional home run. Statistics apply to groups, not to single people or events. Monitoring and Understanding Trends in Extreme Storms State of Knowledge, Kenneth E. Kunkel et al, Bulletin of the American Meteorological Society, April, 2013. The power dissipation index gauges overall hurricane strength. 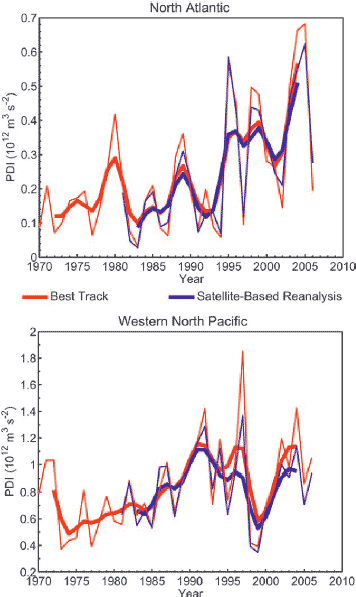 Red: annual values from the best-track data; blue: annual values from satellite-based intensity reconstructions. Although the graphs go up, hurricane rates vary naturally from year to year, so no conclusion can be drawn as to changes in overall tropical cyclone strength, let alone any role of global warming. The answer you get depends on the question you ask. And if you are concerned about the danger of tropical cyclones, you need to think beyond wind speed. Consider rainfall: In 1998, Hurricane Mitch soaked Honduras with rains of 30 centimeters or more, causing floods and landslides. Overall, 11,000 died and an equal number disappeared. Hurricanes are measured on a scale from 1 to 5, and Sandy was only a category 2 when it smashed into New Jersey and New York in October, 2012. Sandy killed an estimated 286 people in seven countries, and has so far cost $68 billion in the United States, where shoreline communities are still struggling. The giant Sandy, the largest hurricane in Atlantic history at 1,800 kilometers in diameter, illustrates the importance of size. Sandy pushed a huge wall of water — a storm surge – into a corner defined by New York and New Jersey, and the surge caused more damage than wind. And so we meet another aspect of global warming. When warming melts glaciers and causes the oceans to expand, it raises sea level. And because the surge rides above sea level, an elevated sea level allows the same surge to reach further inland. 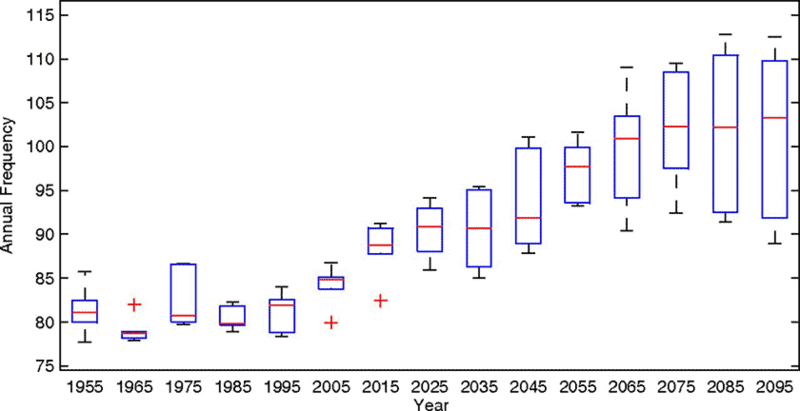 Although the historic rise in sea level is clear, the rise over the next century is debated, says Knutson. And so, when considering the danger of a tropical cyclone, “We have to be concerned about size, intensity, how susceptible the location is; it’s complicated,” says Knutson. 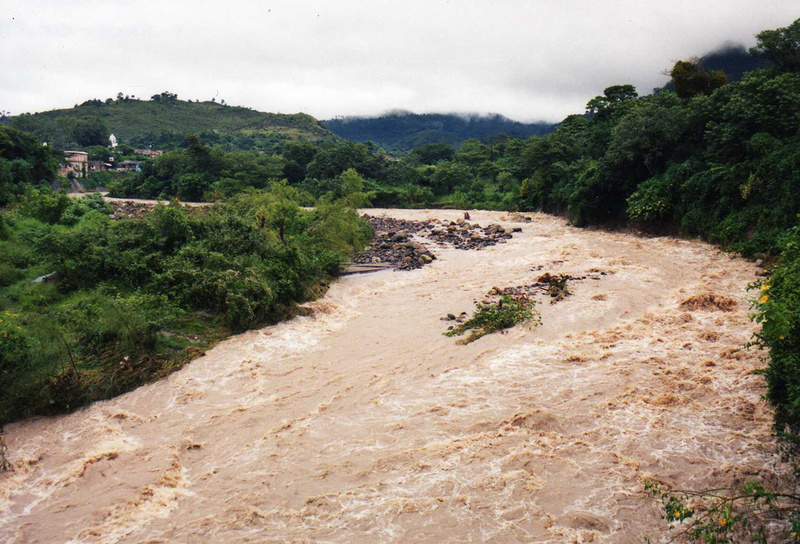 Nueva Ocotepeque, a city in southwestern Honduras, was settled in 1935 after the former town of Ocotepeque was destroyed by flooding. On Nov. 1, 1998, Hurricane Mitch had swollen the river near the new town to the bursting point. Before looking at how much damage can we expect over the next century or so, what about the past century? We asked Willoughby, who noted a calculation by Roger Pielke of the University of Colorado, who factored in inflation, population increase, and national wealth, and found that the level of U.S. hurricane damage between 1900 to 2000, “Was dead flat. To a first approximation, the damage so far scales to the assets in peril,” and not to the size, number or intensity of storms, Willoughby said. The price of federal flood insurance, Emanuel notes, is finally rising, but it has been “a huge subsidy that relatively poor people are paying to the well off” who are building houses along the coasts. Hurricane damage “has been driven by a very unwise policy, greatly underwriting people who are moving into risky regions,” he adds. And so even if warming does not increase the number or ferocity of tropical cyclones, the sea they are riding on is rising, shoreline populations are growing , and the price tag – in dollars or human lives – can only rise. Storm surges are caused primarily by high winds pushing on the ocean’s surface, which piles the water above ordinary sea level. Because sea level is rising with global warming, storm surges are expected to get higher and more destructive. We asked Emanuel if he was frustrated about the difficulty of assessing the past and future effects of warming on tropical cyclones. But rather than lament the state of incomplete knowledge, he concentrated on how to answer the question. “What’s most frustrating to me is that we are not doing a good job of measuring tropical cyclones.” During the Cold war, the U.S. Navy flew into Pacific storms, but it stopped in 1987 to save money. “We are just not monitoring them well,” Emanuel says, and as a result, meteorological authorities “come up with wildly different estimates of how strong a storm is” outside the well-documented Atlantic. “You have to put a probe into the storm,” Emanuel says, suggesting that drones could make the observations at low cost and risk. Trees uprooted by typhoon Haiyan crashed into houses.